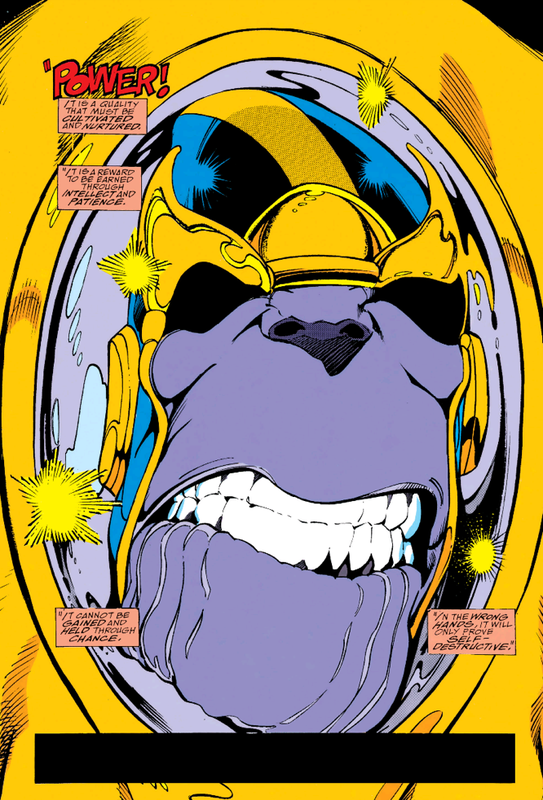 The Infinity Gauntlet by Jim Starlin, Ron Lim, and George Pérez is pretty understandably epic in scale. I don’t know how the upcoming Avengers movie can get to this story without more setup than we’ve seen so far. But, who knows? 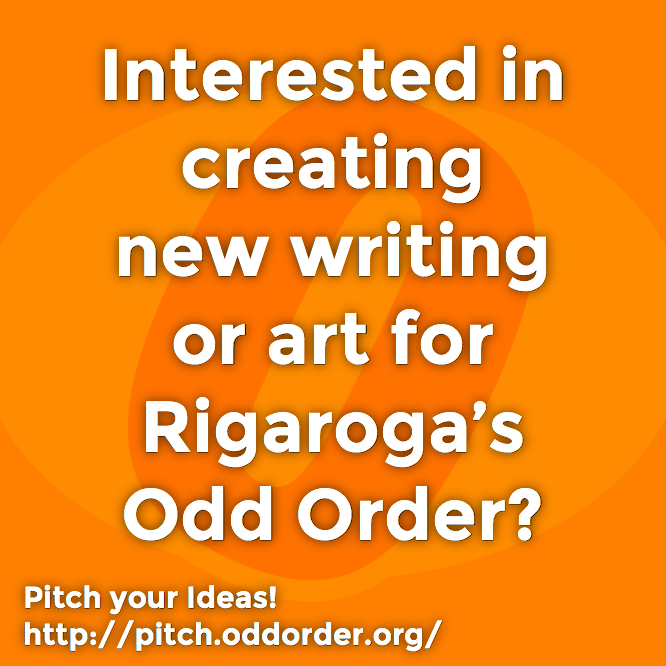 I’ve heard rumours that they might not start with this story right away, which means I started in the wrong place. Oops. It really seems like a huge story arc designed to launch Adam Warlock into an eternal hall of fame at the expense of the entire Marvel universe. Jim Starlin’s Adam Warlock. Jim Starlin the writer of this story. Nothing suspicious here at all, nope. The cosmic elements are the best. 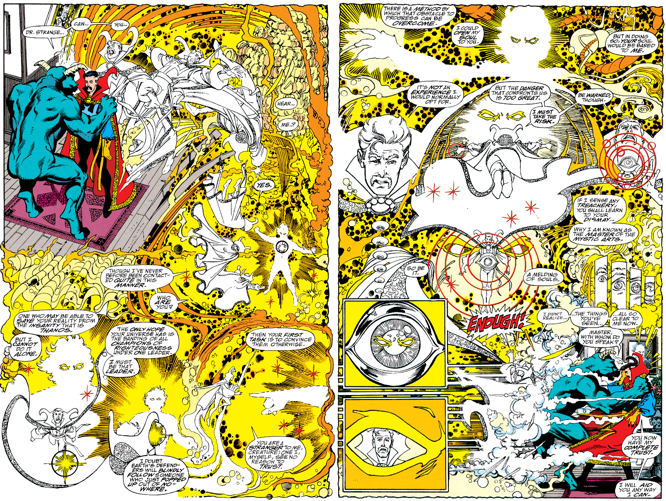 There’s panels with Doctor Strange, Adam Warlock, Celestials and Eternals that knock it out of the park with delicious cosmic visuals. There’s some mind bending bit here to love. 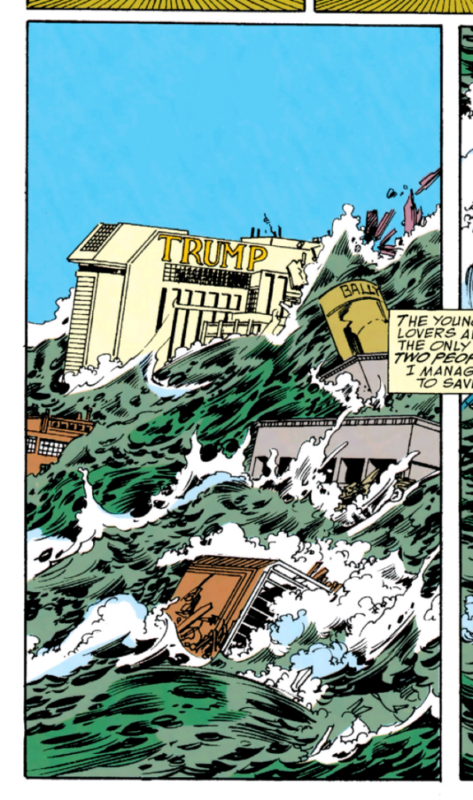 There’s also a cameo of a Trump property getting natural disastered that gave me mean chuckle. But really, it’s Doctor Strange who gets some of the best visuals. The framing story is that Thanos is desperate for Lady Death’s love. It’s kind of pathetic, and perhaps a funny commentary on desperate but unrequited nerd ideas of “love”. 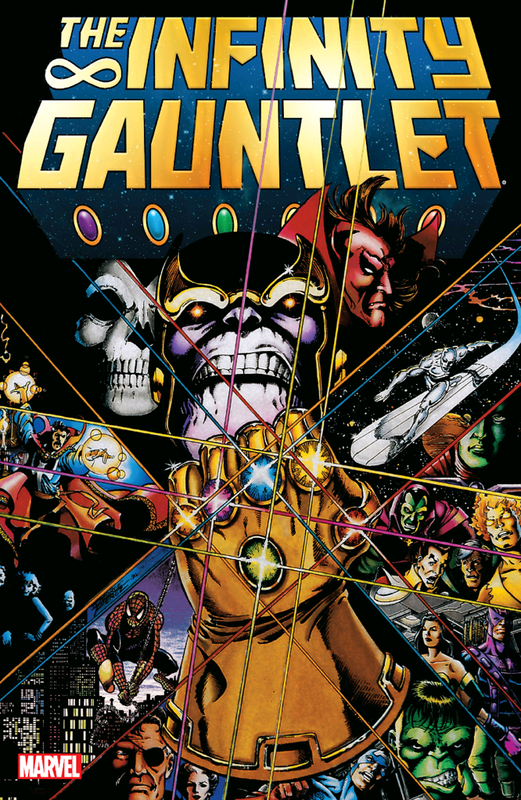 The framing story seems stuck on repeat for most of the series, until the story catches up to where Thanos is at; then the story gets stuck on repeat as the writing plays the same sequence of heroes trying to defeat Thanos while Silver Surfer or someone doubts Adam Warlock over and over for a while. But there’s some great “who’s it” with the Infinity Gauntlet including a couple steals and a fumble to liven things up. As stuck as it may seem repeating in places within this collected volume, it isn’t anything I’ve read before elsewhere. 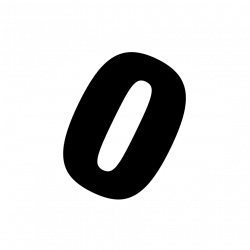 It’s new, but repeats within itself a bit, is what I’m saying. But, it’s good, and, where it does internally new stuff, it does it really well. There’s tons of visuals and moments that struck me, and which I hope to see on the big screen eventually as a bonus. 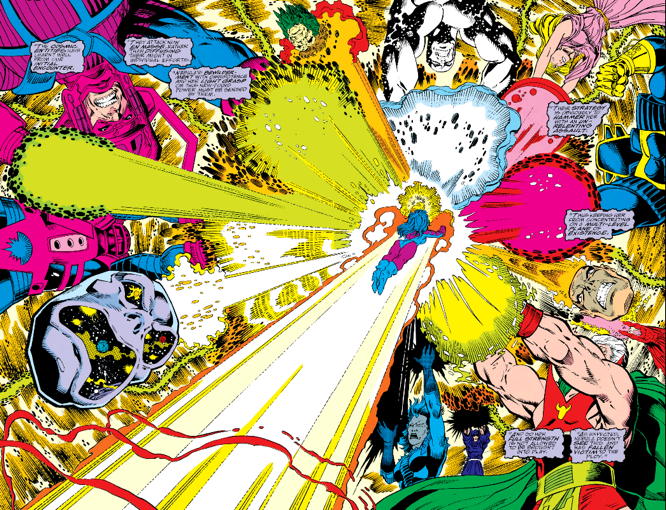 In the end everyone returns to where they were, except Thanos and Adam Warlock, who both, sort of, escape the cycle of statis, ironically by getting stuck in a different, or maybe the same, from a certain point of view, cycle of stasis. I’m certainly curious about the rest of the Infinity Gem Saga, but that’s a lot of material. I hope it stays fresh across the whole sequence of 6 collections. It’s a bit daunting and I feel like I got a good complete story in this collection alone, so I’m not super hype about the rest, to be honest. In that sense, this volume is a nice complete thing in itself without feeling left tricked into needing to read anything else.